We are meant to be mesmerized by the acts and pronouncements of the powerful, endlessly amplified by compliant media that assume the right – and ability – to occupy our minds. One of their primary goals is to make us feel helpless. Global warming, economic collapse, the Middle East – it’s all so complicated, so overwhelming, really, what can you do. ‘What can you do’ erodes from being a practical question into a weary statement of defeat. In fact none of these huge, apparently overwhelming forces are all that complicated. All of them are created by human agency, and all of them are subject to change. It’s a question of how we see them. If we look at the world through one lens, we see it in a particular way. Through another lens, it looks quite different. The people who would control our perceptions, opinions and lives, do so first by controlling the lens through which we see the world and our place in it. For a variety of reasons the extra-ordinary people I feature in Our Way to Fight came to realize they could no longer trust the lens that was provided to them. Over time and through experience they learned to see the world around them through a new lens, with fresh eyes. What they saw compelled them to act. On the ground in Egypt, Syria, Greece, Chile, Iceland, Spain, Britain, in many US and Canadian cities and thousands of other places we’ll probably never hear about, people are shedding the lenses they inherited, to reclaim their own vision, and they are acting on what they see: immense power unjustly and dangerously concentrated in far too few hands, causing catastrophic harm to the earth and to the vast majority of its inhabitants. Whatever comes of these many uprisings – those who horde power hardly ever share it without a fight – this is a stunning moment in the human story. On the streets and in the squares, people are reclaiming ‘what can you do’ as a real question: What can you do? Palestinians have been struggling for six decades to free themselves from military occupation and its dominant myth, that the occupier is so powerful and so ruthless that resistance is either futile or too dangerous to imagine. The forces arrayed against the Palestinians are dangerous indeed: the most powerful military state in the Middle East, unconditionally backed by the most powerful military state on the planet and its servile junior partners (Canada, Britain, Australia, etc), and underlying these, our insatiable addiction to oil, and a deeply conditioned Christian hatred for Muslims/Arabs as old as the Crusades. By this devastating combination of forces, Palestinians have been driven from their land, killed, tortured, imprisoned, betrayed by the world’s elites and their own self-anointed elites, isolated, brutalized and humiliated in nearly all the ways that human imagination at its worst can conceive. Yet still they struggle, still they resist. In Arabic it’s called sumud, steadfastness, holding your ground. They put their lives on the line for the same simple, reasonable goal that drives us all: the right and the means to live a liveable life. It’s not much to ask. And ever-increasing numbers of people outside Palestine are standing with them in their struggle. 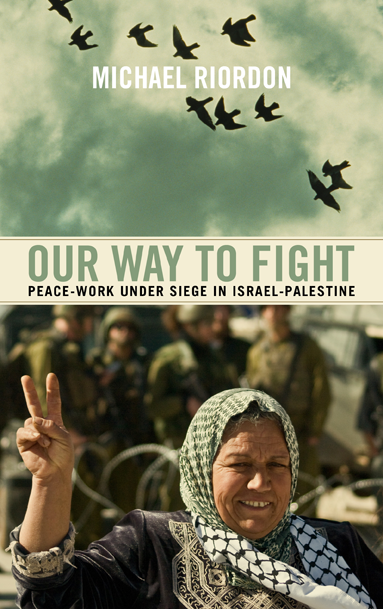 The Our Way to Fight cover photo shows Sayat Um-Said, a Palestinian villager, at a Friday protest in al-Ma’asara. Behind her is a line of barbed wire, and behind that a squad of Israeli soldiers. Sayat Um-Said is in focus and in the foreground, the soldiers are not, which is exquisitely appropriate, a fine rebalancing of human priorities. The photograph was taken by Nicolas Weinberg, a French Jewish photographer. He and Sayat Um-Said both consented graciously to the use of the photo on the cover. That combination – Palestinian villager, Jewish photographer – struck me as a perfect expression of Our Way to Fight. It offers grounds for hope. Both these people have found their own answers to the urgent question, What can you do? “Welcome to Palestine 2012.” This is a high profile initiative, not for everyone, but for some an ideal expression of hope, solidarity and determination. It builds on a similar initiative that occurred in July 2011, when people from Europe and North America were invited by Palestinians to join them for a week of non-violent activities in the occupied West Bank. Calling the western participants “hooligans” and “provocateurs,” the Israeli government prevailed on several foreign airlines to block more than 300 citizens from boarding their flights to Israel. Even so, 130 people from several countries managed to arrive on July 8 at Israel’s international airport, Ben-Gurion in Tel Aviv. Palestinians are allowed no airport of their own, and Israel controls all access to and from the West Bank. In the face of Israeli border policies that nearly always deny entry to visitors intending to travel to Palestinian areas, many simply lie about their destinations. Not this time. By openly declaring their intention to visit the West Bank, Welcome to Palestine participants affirmed the perfectly normal right of Palestinians to receive visitors. They also sought to deepen connections between Palestinians and the outside world, and to draw international attention to Israel’s oppressive enclosure of their land and their lives. At Ben-Gurion airport, Israeli police refused entry to all 130 international visitors, deported several of them immediately, imprisoned the rest until they were processed and deported, abusing many in various ways. Four visitors succeeded in winning entry to the West Bank via Israeli courts. Ironically, the Israeli regime’s characteristically repressive action spectacularly illustrated the compelling need for such initiatives. Join Welcome to Palestine 2012, which begins on Sunday April 15th 2012, with flights from many international airports to Occupied Palestine, via Ben-Gurion Airport in Tel Aviv, Israel. We invite you to join us in the construction of four schools for Palestinian children and youth in Bethlehem: a kindergarten, a primary school, a high school, and a vocational school. The four schools will be built near a road (closed to Palestinians) which connects the illegal settlements of Gilo to Bethlehem and Hebron. There is no way into Palestine other than through Israeli control points. Israel has turned Palestine into a giant prison, but prisoners have a right to receive visitors. Welcome to Palestine 2012 will again challenge Israel’s policy of isolating the West Bank while the settler paramilitaries and army commit brutal crimes against a virtually defenceless Palestinian civilian population. For more information, go to the BienvenuePalestine website. At the far top left corner of the home page (in the grey page border), select ‘English’ and click on ‘Translate.’ So far it’s only a Google translation, a bit strange, but possible to muddle through. Please forward this invitation to others. Versions are also available in Arabic, Bulgarian, Dutch, French, German, Greek, Italian, Malay, Norwegian, Polish, Portuguese, Spanish, and Turkish. What can you do? Welcome to Palestine!